SILICON SLOPES, Utah – March 22, 2016 – Today, Domo jumpstarted the Business Cloud, launching the Domo Appstore with more than 1,000 business management apps. These apps are a mix of free and premium pre-packaged solutions that are easy to discover and use, enabling any decision maker to get real-time answers to their specific business questions. Whether it is someone in marketing, sales, finance, operations or IT, learning better ways to manage your business has been a challenge that no one has solved – until now. The Domo Appstore solves this problem with apps that deliver industry best practices, benchmarks and best-in-class visualizations that are entirely self-service and immediately available to decision makers. The CEO: Social Index: Allows CEOs and anyone with a social presence to understand how their social brand compares to competitors and industry peers. Marketing: Mobile App Performance: Aggregates mobile app performance from across nearly a dozen data sources to provide a unified view into mobile app engagement, adoption and critical opportunities for monetization. Sales: Sales Forecasting: Allows Sales leaders to compare sales actuals vs. forecast, quickly identify customers, territories and sales reps that are at risk, and socialize these risk areas across the team for immediate action. Finance: Travel Expense Management: Provides instant access to dozens of industry best practice metrics to optimize travel expenses across flights, hotels, car rentals and the entire employee base. IT: Corporate Phishing: Empowers the IT organization to identify top phishing targets, spot anomalies over time, set alerts on failure rate spikes and reduce overall corporate risk. Human Resources: Recruiting Optimization: Allows HR to quickly visualize key metrics like days to hire and cost per hire across department, function, and location, empowering HR professionals to reduce the overall cost and time to hire. 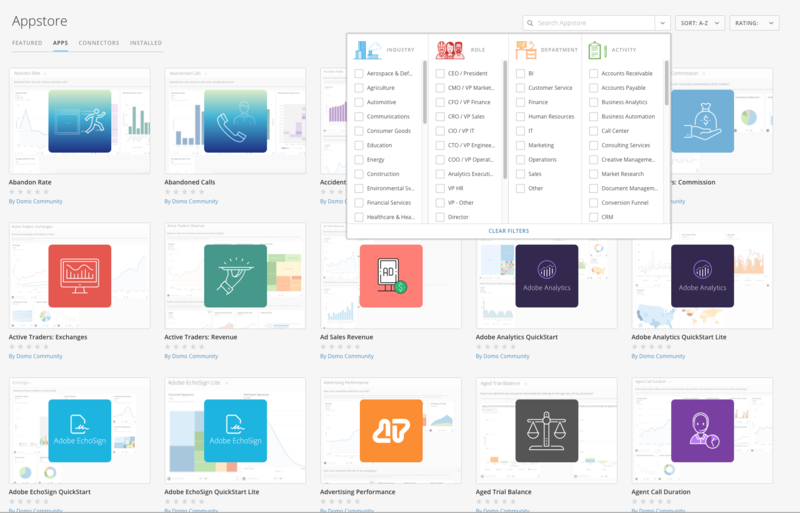 Organization Wide: Predictive Toolkit: A revolutionary app that provides a “data-scientist-in-a-box,” allowing decisions makers to predict critical metrics like customer cancellations, sales opportunities and marketing conversion rates. To learn more about Domo’s Appstore, visit domo.com/Appstore. Today, Domo also launched the App Publisher Partner Program to provide the tools, best practices and support necessary to expand the ecosystem of apps available in the Domo Appstore through developer partners.